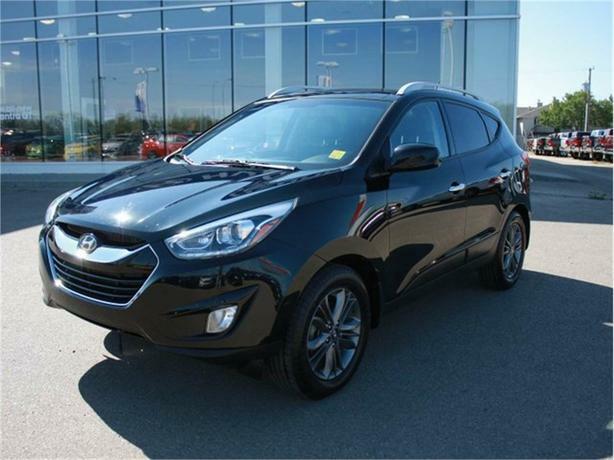 Our 2014 Black Hyundai Tucson GLS/LTD was locally owned, and originally purchased here at Hyundai. Owned by a mature woman, simply traded in for something a little bigger for changing needs. We have given it a complete inspection, performed by one of our certified technicians to ensure everything is ready for the next proud owner. It has also been through a complete maintenance scheduled for 84,000 km servicing including brake service, rotation and alignment for tires, brake fluid flush, charging system check and more. Coming very nicely equipped with heated seats, remaining factory warranty, bolstered leather, all wheel on demand with four wheel lock and more. To find our more, email or call our friendly salesteam today!